If your child loves to swim and is looking for a fun and challenging sport, consider joining the Jenks Trojan Swim Club. Our club is a competitive USA affiliate program for swimmers seven years of age and older in Jenks and the surrounding area. We offer professional instruction for all competitive levels, from novice to nationals. Practices take place at the state-of-the-art Jenks Trojan Aquatic Center. Come join the fun along with hundreds of our other members at one of the best air and water quality swim facilities in the nation. For more information about the club, visit jenksswimclub.com. If you’d like to schedule a tryout, please contact either Diego or Austin. Over the last several years, the Jenks Trojan Swim Club has built a team and organization that people want to be part of. We are making a difference by looking at challenges as part of the process and a fun thing to do. We have been recognized in our swimming community in the State of Oklahoma as a very well-known program and organization. 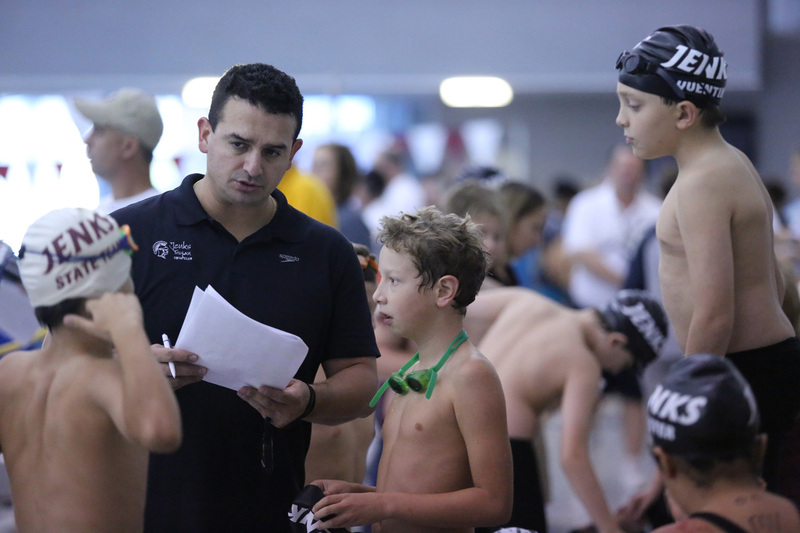 Also, JTSC has significantly influenced the Oklahoma swimming world by adding and bringing in many local and regional competitions to the State. This report details some of the JTSC achievements for the last few years. Four members of our Coaching Staff will be going to the 2018 ASCA Conventions this September 4-9, 2018 in Anaheim, California. Once again, JTSC increased the number qualifiers for our Division II Championship and the Oklahoma State Meets (short course and long course). Cooperation from our JTSC parents has been amazing. We really appreciate the collaboration and assistance from all of our members who have stepped up to give their valuable time to learn and successfully help run meets. JTSC hosts around 10 meets a year and we couldn’t do it without your help. So Thank you parents for your hard work as well! The number of JTSC trained officials who represent our team in the many local and regional meets has grown and we appreciate you going the extra step to be involved. Our club has been recognized by Oklahoma swimming at our annual House of Delegate meeting for having the highest number of officials who represent us at many Oklahoma swim events. Our Team has received many compliments from many different members of our community and from our Region, including: coaches, officials and parents. The JTSC advisory board members are great group of professionals who have given an enormous amount of their time to work together and lead our team to success. As finances goes, I am pleased to say that we are a very strong financial organization. We are again able to plan ahead and completely be in the process of budgeting for the year ahead. I believe the JTSC has grown to be a well-established organization and will continue expanding and improving for our community for many years to come. Last but not least, Twenty Three (23) New Team Records were broken this season. Please click here fore more details of our Long Course season.